Good of the Order chairman Jim Shaw takes on the monumental efforts of the Polar Plunge for Catholic Education as well as our Wounded Veterans programs. In addition to this Jim is a steadfast supporter of Mater Dei and their football team. This is just another day volunteering that he undertakes. No, he is not delivering mail. 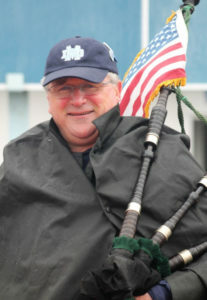 But in rain or snow, Jimmy proudly plays his pipes at every Mater Dei football game. Whether they are 9-0(currently) or 0-9. Good for them!